If there's anyone on the planet who has the authority to judge footwear, it's New Yorkers. Experience one day walking around this city in miserable shoes and you're forever changed. 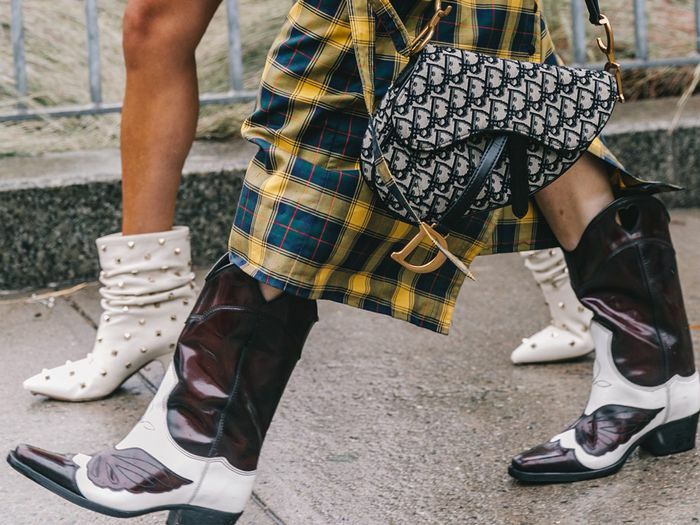 With that said, New York girls pick and choose the shoe trends they buy into very meticulously, and we were itching to find out what some of the most stylish women in NYC are buying this season, in addition to what they aren't. We asked five women who currently have a heavy influence on the fashion scene here in New York which shoe trends they are currently "laughing at." Some of the responses were due to practicality, while others boiled down to sheer distaste, but in the name of positivity, they also filled us in on the shoe trends they are loving right now. This way, you would have a handful of New York–approved shoe trends to shop. You're welcome. Go on to find out which shoe trends New York girls can't stop laughing at and which ones they can't stop thinking about. "While I respect those who want to be a little bit #extra, I am not here for giant sneakers with logos AND crystals. They're wildly expensive and just scream trend to me. "I am, however, ready for the return of the sleek '90s mule." "ATM, I laugh a giddy laugh when I see people walking around with slip-on shoes. AKA, they made non-slip-on shoes slip-on. I do this all the time out of sheer laziness, but continue to do it because it's a look, no? "I'm also still loving the cowboy-boot trend. However, for me, I think it's evolved into a lifestyle rather than something fleeting." "A shoe trend that makes me laugh because my dad invented this/humiliated me in middle school with it is any sort of foam/elastic/Velcro sandal with a sock. It's also creepily something that I'm kind of wanting to experiment with (but with a metallic, shimmery sock). "The shoe trend I am OBSESSING OVER (inspired by you, Ms. Eggertsen) is the chic Mary Jane shoes à la Carel. I want this shoe in my life DEARLY, but they are SO hard to find. I love that you can wear them with a jean or a dress and look so effortless and put-together." "While this may fly in other climates, in NYC, there is rarely a day where the climate allows for an open-toe shoe while simultaneously requiring a boot. It just doesn't make sense! "Instead, when the weather warms up, I'll be taking floss heels for a spin." "What I won't be wearing are dainty embellished pumps. They're honestly very chic. I just don't feel like standing around, in turn, anymore. "As someone who proudly dives headfirst into ugly shoe trends since middle school, I'm always down for the chunkiest contrary kick on the fashion block. I'm also having a mini love affair with anything that resembles a cowboy boot ATM." Next up, get inspired by all the outfits spotted at Copenhagen Fashion Week.